Steven Adams is a prospect we've been evaluating for the better part of three years now, having watched him for the first time in Los Angeles at the adidas Nations when he was 16 years old, and virtually a complete unknown. His profile increased substantially a year later when he again returned to the adidas Nations and had a very impressive outing against a number of top high school recruits, which kicked off speculation that he might skip college and enter the 2012 NBA Draft as a 19-year old early-entry candidate. Adams eventually elected to honor his commitment to Pitt after moving to the US mid-season to attend Notre Dame Prep, a school with a checkered past which served as a holding spot to keep him in line to get eligible for college. Once Adams returned to New Zealand to visit his family for a week, things changed, as he returned to Pittsburgh and shortly after announced his intentions to enter the draft, citing his desire to help his family. It's time for me to help my family. There's certain family members who I feel need a bit more help than the others. I don't like seeing them struggle. It's quite sad to see your family struggle, you know what I'm saying. I don't want to see that anymore." Adams' main virtues as a NBA prospect continue to revolve heavily around his physical profile, as he has rare size, a strong frame, and excellent athleticism. He runs the floor well, is extremely mobile, and has very good quickness for a player his height, also being capable of playing above the rim when called upon. Offensively, Adams was a very limited player at Pitt, averaging 7 points in 23 minutes, or 12.3 points per-40 minutes, which is the fourth lowest rate of any of the 75 college players in our top-100 prospects. While he was efficient from the field in his limited attempts (57%), he struggled badly from the free throw line, making just 44% of his attempts, a pretty good indication of where his skill-level is at in this stage of his development. Not a focal point of Pitt's offense, being responsible for just 11% of his team's overall possessions, Adams' biggest source of touches came from the offensive glass, where he was extremely effective. His 5.2 offensive rebounds per-40 minutes ranks 3rd best among collegiate top-100 prospects, as his combination of size, quickness, mobility and intensity were extremely effective in making his presence felt on the offensive glass. He also saw some looks working off the ball, running the floor in transition, and even occasionally with his back to the basket, but struggled to make the most of such opportunities on a consistent basis. Adams has very crude footwork in the post and little in the ways of countermoves if the defender is able to cut off his initial action. He often decides what he wants to do with the ball seemingly before he even catches it, not reacting to how his defender is playing him and struggling to improvise on the fly if his initial plan goes awry. He's very mechanical with his movements and not overly instinctive with his approach to the game, which leaves some concerns about how much he can improve on this end of the floor in time. Even more concerning though is how poor of a finisher he appeared to be around the basket this year. Adams had a difficult time catching the ball cleanly all season long resulting in quite a few turnovers. He bobbles the ball on the catch regularly, as he seems to need to have it thrown to him perfectly so he can get two hands around it, at times using his chest to assist him. Because of his lack of control upon catching it, he tends to either hesitate going up strong for the finish, or just throws the ball up on the rim, seemingly just hoping for the best. The fact that he doesn't get great extension on his moves around the rim makes him fairly predictable and resulted in him getting his shot blocked a fair amount relative to his small number of touches. Additionally, Adams has a bit of a subdued, non-chalant demeanor on the floor, rarely looking angry or in much of a hurry, which results in some relatively soft finishes. While he's very explosive, rarely did you see him getting angry and just powering up through a defender and jamming it home, which further hampered his effectiveness on this end of the floor. Stepping away from the basket, Adams is not much of a threat, as you would probably guess by his mediocre free throw shooting percentages (44%). He shoots the ball with poor mechanics, locking his elbow, not setting his feet, and showing no follow through on his release. Combine that with his average touch and it seems he has a long ways to go to become a legitimate threat outside of the immediate vicinity of the basket. Where Adams looks much closer to being able to contribute to a NBA team is on the defensive end. His quickness and overall mobility is extremely impressive for a player his size, and allows him to make a significant impact on this side of the floor, particularly on the pick and roll. Adams can step out on screens and recover very effectively, even being able to switch out on guards at times and not look entirely uncomfortable. He'll get beat off the dribble at times, but is athletic enough to recover and still make a play at the rim, showing very good instincts as a shot-blocker. Adams seems to have good potential as a rim-protector, already rejecting 3.7 blocks per-40 as a freshman, which ranks fifth among collegiate top-100 prospects. In the post, Adams does a solid job, looking patient and not fouling too often, playing under control and showing a much better feel than he does on the offensive end. With that said, Adams' technique and fundamentals still have a long ways to go, as he tends to give up deep post-position too frequently to stronger opponents, closes out wildly contesting shots on the perimeter, gets lost off the ball, and will make some ill-advised plays stemming from his lack of experience and coaching. Adams also isn't as good of a defensive rebounder as you might hope, ranking second to last in that category among top-100 collegiate centers. He rarely boxes out opponents, mistimes his jumps, and has a difficult time coming away with loose balls in traffic because of his questionable hands, something he'll need to improve on considering the role he'll be expected to play in the NBA. All in all, Adams is clearly a long-term project who a team will need to invest a few years of solid coaching in order to be able to expect to reap benefits from down the road. He may never develop into anything more than an average player offensively, but has excellent potential defensively thanks to his terrific physical tools, which could convince a NBA team to invest a pick on him somewhere late in the first round. Teams will first want to get a better feel for his mental approach and all-around feel for the game in private workouts, interviews and background checks. Steven Adams (#7 Scout, #4 Rivals, unranked ESPN) didn't have a great performance at the Hoophall Classic, but it's not unexpected seeing how he's been with his team and in the United States in general for just a week. Having just finished high school in New Zealand, Adams joined his new team and is obviously still getting up to speed with both his new teammates and the heightened level of competition he's seeing going up against his peers. There really wasn't much new to take away from Adams' game since the last time we've seen him, as he remains an excellent physical specimen with a high motor and still developing skill set. Adams struggled to get consistently involved here, especially on the offensive end, and finished with a modest line of just five points and four rebounds in 21 minutes. Adams frequently fought for deep post position on the offensive end, but was mostly ignored by his guards or not rewarded with re-post opportunities when he kicked the ball out. He did a solid job fighting for put-back opportunities on his own, scoring both of his baskets in that manner. He didn't show much from an offensive skills perspective overall, being limited to mostly hustle plays for his contributions. Defensively, Adams looked a bit better, blocking an impressive three shots to go along with two steals, showing a similarly good motor on this end of the floor and also displaying an impressive sense of timing on his shot blocks. He did a great job using his full extension and mobility to block shots, doing a very good job in that regard. Looking forward, Adams remains a very intriguing player in the long term, but you probably can't take much from this performance given his poor conditioning-level and limited time here in the US, along with just the nerves of playing in a setting like this for the first time. Spending the rest of the season playing prep ball prior to joining Pittsburgh next year should help his acclimation to the higher level of competition, but he'll have plenty of work to do developing his game once he gets on campus next season. The clear-cut breakout star of this event, Steven Adams has made some very interesting strides since we first profiled him a year ago in Chicago. An inch or two taller, and a little more developed physically, Adams is still the same highly fluid and athletic center who runs the court well and shows great mobility for a player his size. He elevates with ease off the floor for blocks and dunks, using his length and huge hands extremely well to challenge shots and finish plays around the rim. Adams still lacks a great deal in terms of fundamentals on both ends of the floor, a testament to his late start in basketball and the low level of competition he's faced exclusively thus far in his career. He does not possess much of a post-game and is a little bit wild with the way he conducts himself offensively, but shows intriguing sparks of talent from time to time with the things he does. He likes to put the ball on the floor and can beat opposing big men off the dribble with his quickness and aggressiveness, often finishing well above the rim in impressive fashion. He'll also step out to the perimeter on occasion for jumpers, usually with mixed results, but shows good touch from the line which is an encouraging sign at his size. He also showed unusual passing ability, often making Kevin Love-esqe outlet passes to ignite the fast-break. The first impression you get from watching Adams play is that he has a limited feel for the game, but some of the passes he made suggest otherwise. Defensively, Adams is both impressive to watch and a work in progress at the same time. On one hand he does a great job challenging shots around the rim with his size, length and terrific athleticism, showing nimble feet and good timing. He plays with a real chip on his shoulder, not backing down from anyone, and not being afraid to dish out a hard foul or offer up some choice words to an opponent. On the other hand, he clearly has no concept of how to play fundamentally sound half-court defense, giving up deep position without any fight, and showing a very limited understanding of help-side defense. He doesn't really know how to use his body inside, does not box out his opponents, and is too quick to chase blocks wildly. The wide open, loosely coached setting of the adidas Nations played perfectly into Adams' rare strengths as a prospect, and he generated a tremendous amount of buzz in return with his play. Right now his plan appears to be heading to Pittsburgh to play for Jamie Dixon in 2012. If he gets eligible, there will surely be some initial growing pains as he adjusts to the completely new style of play that he'll encounter in the Big East. Adams is still very much playing catch-up with other players his age in regards to his fundamentals and knowledge of the game, but his ceiling as a prospect is obviously off the charts. It will be very interesting to see how he performs when he finally does come over. 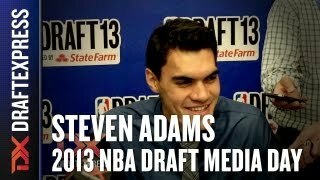 A video profile featuring 2012 center Steven Adams from the adidas Nations Experience in Los Angeles.